Sometimes, out of the blue, you bump into a really great training environment. When it happens, it’s usually in an unexpected place, out of the way, lying low that is, until you get there. We landed in Nassau this March, and were looking for something interesting to do. As we always do, we googled ‘simulator’ and bingo, Jetline Simulation Bahamas came out. Owned by former airline pilot Ryan Moree, Jetline went to business with a single 737NG sim, brand new and fully equipped with upgraded visuals, a vibration system and, as Ryan says, a real 737 cockpit door. The simulator is a full-size Flightdeck Solutions FDS-B737NG-FBPT running a visually enhanced ProSim/P3D version. Foreflight and Instructor stations on iPads, jumpseat and observer seats in the back of the cockpit. 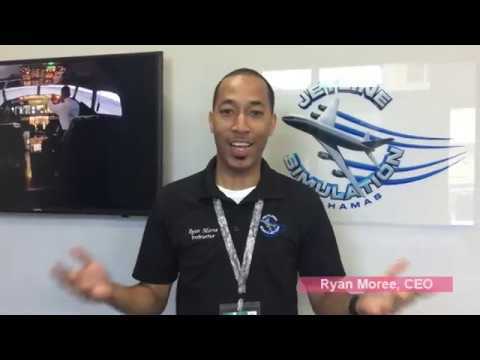 An interview with Ryan Moree, CEO of Jetline Simulation Bahamas, an outfit that offers a great 737NG simulator at a very affordable price, for proficiency training or just fun. Located in Nassau, Bahamas, it's a place to put on your list! Greeted by Ryan, the owner, and James, one of the sim procedures instructors, we got an hour slot on the sim. I am not an airline pilot, having only flown mostly GA land, fixed wings aircraft in thirty years of flying. But like most GA pilots I have always been fascinated by airline cockpits and always wanted to learn more about them. James was my mentor there. James has an interesting story. 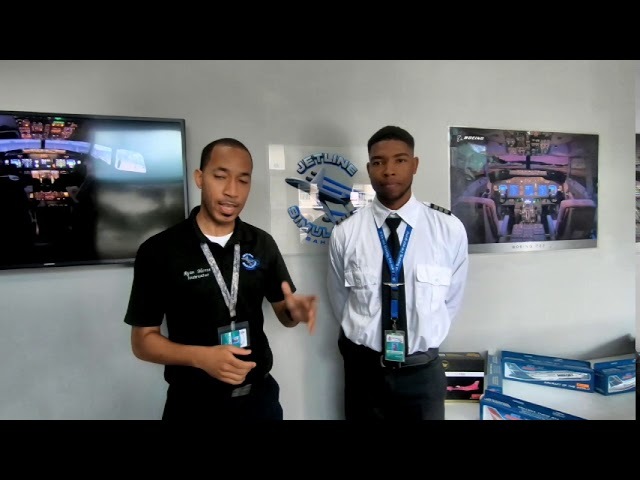 With 1 (one) hour of real flying, due to restrictions on visas into the US and the lack of schools in Bahamas, this 20 years old found himself employed at Jetline and learned all about flying and managing the the 737NG (New Generation) complex systems. James has full mastery of every control on the cockpit, understands every procedural nuance and now knows how to fly the sim as smoothly as a seasoned airline pilot. Ryan Moree at Jetline Simulation Bahamas introduces James Woodside, a procedural instructor on the 737NG Simulator. We took off from KLGA with the intention to fly to Deer Park VOR (DPK) then turn around and shoot a Rwy 31R approach into KJFK. On our first turn I ended up way too high for a safe landing, glideslope pegged. We declared the landing missed and were routed by the simulated ATC out and around back for another turn. This time I was determined to hand-fly the aircraft, which I did with a safe landing but a bit off the side of the runway. The very realistic vibration system announced our arrival firmly and with no ambiguity. AFSBI's short flight from KLGA to KJFK under the expert guidance of James Woodside, a procedural instructor at JSB in Nassau, Bahamas. James then asked me if I wanted him to demonstrate an approach to near minimums, with weather and turbulence, which gave me an opportunity to GoPro him from the left seat. He reset at KLGA, took off, switched the weather scenario and hand-flew a nearly perfect flight director-guided approach. We broke out at about 500′, runway environment in sight. As expected James did a greaser, with no big response from the vibration system. If you are training or expect to be interviewed by an airline and 737 is your preferred aircraft, you should look into giving Jetline Simulation Bahamas a try. Granted, it may be a bit out of the way, but if you like to spend a few days getting practice on the sim, this is the place for you, as we said above, because of a number of reasons. Price, first, probably the lowest we have seen for this class of sim. Really friendly and knowledgeable staff, which will make you feel right at home, and a great beach a few steps away to relax when you are not flying. A winning combination indeed! Check them out at Jetline Simulation Bahamas on Facebook, or Instagram.